I’m a Wall soldier, I don’t know why. My girl’s in Tungria; I sleep alone. I don’t like his manners, I don’t like his face. There’d be no kissing if he had his wish. 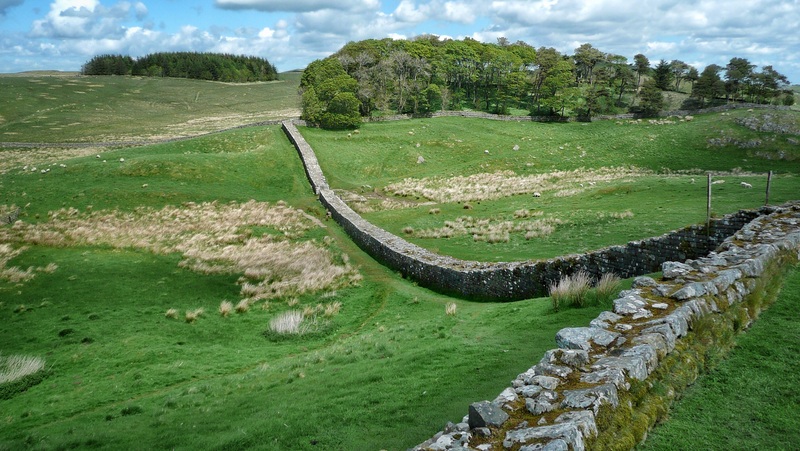 We have marveled at Roman brickage from Syria to Cirencester, from Bath to Baalbek, but have never ventured to Hadrian’s Wall in Northumbria. WH Auden’s whimsical song came to mind as we stood atop the windswept knoll that is Housesteads Roman Fort. On the edge of empire. The Roman Empire, that is. Outposts and outcasts. Up on the hills in the wind and the rain, the snow and the sleet, and in the valley below with the baths and the brothels. This is where worlds collided. Between Roman cives and their satraps, and barbarians. Between Britannia and Caledonia. Where solders from Rome and the Italy-yet-to-be that surrounded it, from Gaul, Batavia, Asturias and Tungria, now France, Spain, and the Low Countries, from Germania and Sarmatia in Central and Eastern Europe, marched and marauded, drank and dined, foraged and fucked, lived and died. At the height of Empire, some seven hundred soldiers manned the fort we now call Housesteads, up high on the moors, a windswept outcrop with a 360 degree vista. Many more garrisoned the more sheltered Chesters Fort in the nearby-by valley where the wall crosses the Tyne. These included cavalry, drafted from Sarmatia, in present day Hungary. This was the fanciful premise of King Arthur (2004) starring Clive Owen as a tortured soul wandering through a flawed film, and Keira Knightly as a scantily clad warrior Guinevere. At Vindolanda, to the south, a small town grew up around a large military camp. First of wood and then of stone, constructed by the legionnaires themselves, who included in their number skilled masons and carpenters, these settlements endure to engage our imaginations today. In times of turmoil, these soldiers fought and fell. In quieter times, they relaxed and recuperated. And the locals gathered about them, built houses and gardens, opened shops and pubs. And life went on like it does in our time. During conflict, the Roman auxiliaries guarded the borderlands, deterring the Picts, the painted people who raided from the northern badlands. When peace prevailed, the locals visited, traded, and settled in the viccii or villages that grew organically to the south of the forts that were constructed at intervals along the empire’s perimeter wall. There, they traded, and provided goods, services, and entertainment for themselves and for the martial strangers that had come amongst them. In the early days, the auxiliaries were not permitted to bring wives and children to the frontier. But folks being folk, they very soon established friendly relations with their neighbours, and legionaries would keep informal wives and families in the vicus. Soviet writerVaslily Grossman encapsulated all this poignantly and succinctly in An Armenian Sketchbook: “The longer a nation’s history, the more wars, invasions, wanderings, and periods of captivity it has seen – the greater the diversity of its faces .Throughout the centuries and millennia, victors have spent the night in the homes of those whom they have defeated. This diversity is the story of the crazed hearts of women who passed away long ago, of the wild passion of soldiers intoxicated by victory, of the miraculous tenderness of some foreign Romeo towards some Armenian Juliet”. Officers were allowed to bring their wives and children to their postings, and these endured their provincial, primitive exile by importing the necessities of a comfortable Roman life. Including the celebrated Roman plumbing and central heating. Chesters boasts the best preserved military bathhouse in Britain. And so, the accessories of civil consumerism reached the frontier. Food and wine from the warm South were transported to the cold northlands. Fashions in clothes and jewelry, day-to-day articles and artifacts, from glass and pewter dinnerware to cutlery, tools and sundry hardware. Remnants and reports gathered in the Vindolanda museum opens a window into a gone world. The wonderful Vindolanda tablets have preserved a picture of the oh-so-normal lives of these transplanted souls so far away from home. Amidst accounts and inventories, orders dispositions, a quartermaster reports that supplies of beer are running low. An officer writes to another in a neighboring fort inquiring in the availability of accommodation for visitors and the quality thereof. One tablet reveals that Roman soldiers wore underpants, which, in view of the locale and climate thereabouts, is comforting to know. And another recounts workplace harassment and bullying that would today invoke grievance procedures. The wife of an officer invites another to a birthday party at her house in Vindolanda. There is an undercurrent of “Please come, I am bored shitless”, though a polite Roman matron would not commit such sentiments to a wooden tablet. It is probably the oldest surviving document in Latin written by a woman. So who were these folk so near to us in their needs and desires, their hopes, fears and expectations, and so far from us in time, space and purpose? What did they think and feel? It is a question oft asked by empathetic history tragics. The thinking of another time can be hard to understand. Ideas and ideologies once compelling may become unfathomable. And the tone and sensibility that made those ideas possible is even more mysterious. We read, we ponder, and we endeavour to empathize, to superimpose the template of our value system, our socialization, our sensibilities upon the long-dead. And thence, we try to intuit, read between the lines, draw out understanding from poems, plays, novels, memoirs, pictures, photographs, and films of the past. We feel we are experiencing another facet of the potential range of human experience. But in reality, we are but skimming the surface, drawing aside a heavy curtain for a momentary glimpse through an opaque window into the past. Yet, we persist nevertheless, because that is what humans do. Over two and a half thousand years ago, the controversial Greek poetess Sappho wrote ”I tell you, someone will remember us; even in another time”. Here is some further reading about Vindolanda. And some pieces from my ‘Roman’ period. One of the great unsung saviours of the UK’s heritage is remembered in the museum housing his remarkable collection at Chesters Roman Fort Museum which houses the Clayton Collection of and 5,500 catalogued items from a variety of sites along the central section of the wall. Few people today have heard of John Clayton, yet he is one of the single most important individuals in the history of Hadrian’s Wall. 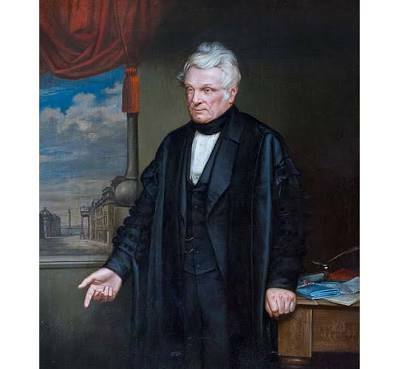 A classically educated Victorian gentleman who combined demanding roles running the family law firm and acting as town clerk for the city of Newcastle-upon-Tyne, Clayton had a passion for archaeology and the Roman military legacy in his beloved Northumberland. Were it not for Clayton, large parts of Hadrian’s Wall would have disappeared as the industrial revolution fuelled the demand for stone to build factories, mines and mills. His role in the preservation and survival of Chesters Roman Fort – the best-preserved Roman cavalry fort in Britain, is now undisputed. In the early 19th century Clayton lived at Chesters House in the parkland surrounding the Roman fort and from an early age became fascinated by the Roman relics that surrounded him. The museum housing the Clayton Collection was opened next to the fort site in 1903, 13 years after his death. It is privately owned but curated by English Heritage on behalf of the Trustees of the Clayton Collection, and has been refurbished to bring it up to 21st century standards of conservation, display and interpretation. Yet, great care has been taken to respect its character and to retain the feel of a 19th century gentleman antiquarian’s collection, and many of the labels and original cases have been retained..